Reception in honor of graduates from military academies. 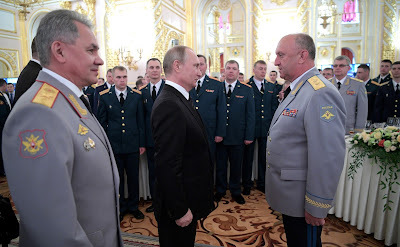 Putin.BLOG Armed Forces Universities Reception in honor of graduates from military academies. 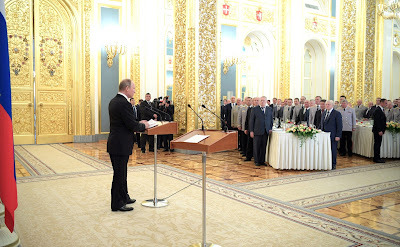 A reception in honor of graduates from military higher education institutions run by the Defense Ministry, Interior Ministry, Emergency Situations Ministry, Federal Security Service, Federal Penitentiary Service, Federal Guard Service and Federal National Guard Service was held at the Grand Kremlin Palace. Russian President Vladimir Putin with military academy graduates at a reception in their honor. Over 700 officers who graduated with distinction and a gold medal have been invited to attend the reception at the Kremlin, along with lecturers and academy heads. Speech at reception in honor of graduates of military academies and universities. 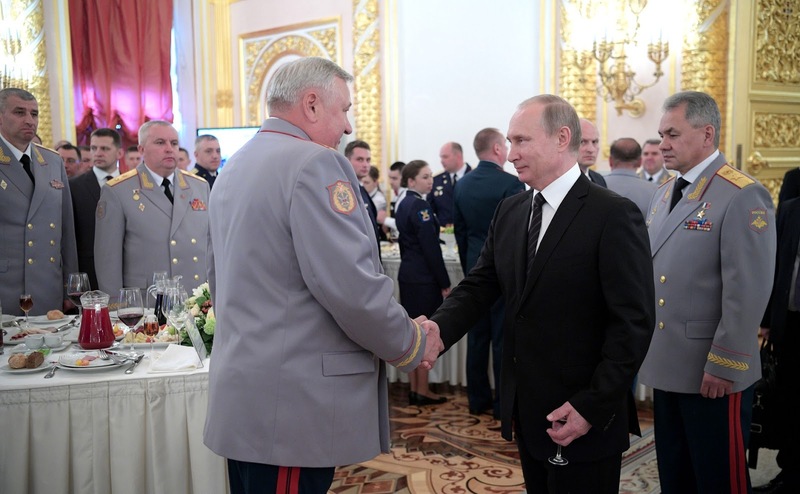 In keeping with the tradition, we are here today in the Kremlin to honor the best graduates of military academies, institutes and universities. I congratulate you on successfully completing your studies and entering a new stage in your career. You have excelled during complex graduation tests in military subjects, showing the ability to use cutting-edge equipment and weapons. I strongly believe that you will use the acquired knowledge and skills by serving in the Army and Navy, law enforcement agencies and secret services, guarding Russia’s security and standing up for its national interests. 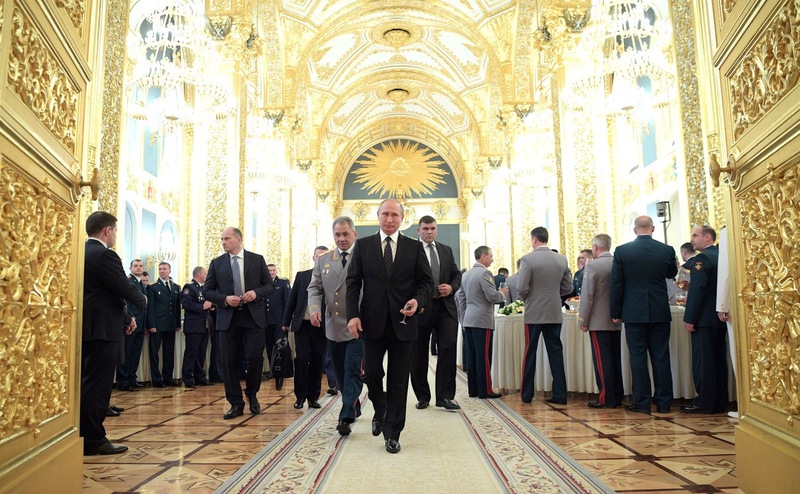 Vladimir Putin at a reception in honor of graduates of military academies. 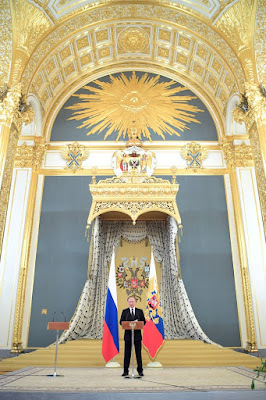 It is symbolic that we meet in the historic halls of the Moscow Kremlin that are filled with the spirit of Russia’s feats of arms of the past. During the Poltava and Borodino battles, on the battlefields of the First World War and the Great Patriotic War, our military commanders, officers and soldiers have won immortal glory by their military skills, as well as moral: courage, honor and dignity. We are proud of the feats of our remarkable ancestors who did not spare their life to preserve what mattered the most for them – the freedom and independence of their Motherland. 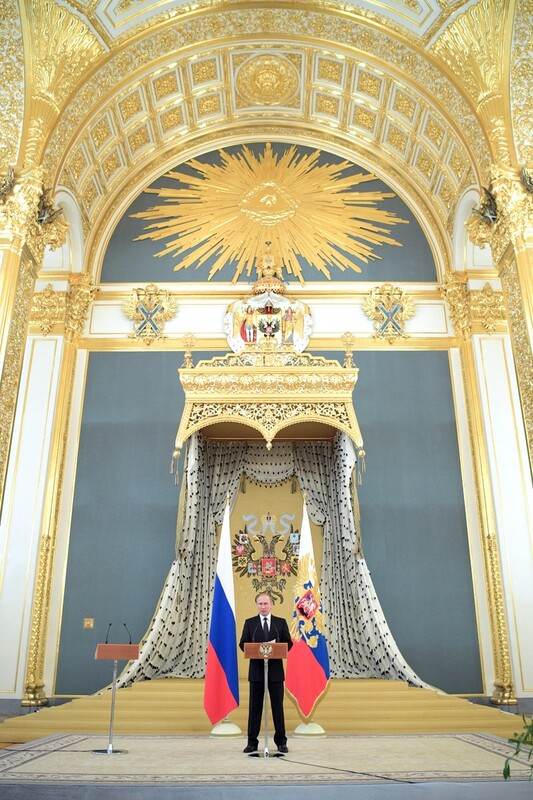 I am confident that you will be their worthy successors by protecting Russia and its people with honor and dedication. The complex international situation, the growing number of regional crises and conflicts, terrorist and other threats demand constant enhancement of our country’s military organization. 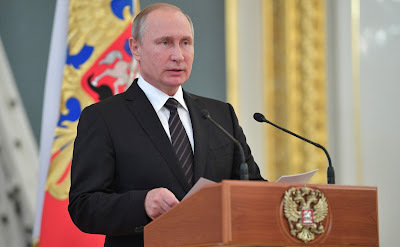 Only modern, powerful, and mobile armed forces can guarantee our country’s sovereignty and territorial integrity and protect us and our allies from any potential aggressor and from pressure and blackmail from those who do not want to see a strong, independent and sovereign Russia. Over these last years, we have strengthened substantially our armed forces and officer corps’ professionalism has grown. This was demonstrated convincingly by our antiterrorist operations in Syria. We will continue to further build the military capability of our Army and Navy on the basis of our long-term plans and programs, ensure balanced, systemic work to develop all branches and forces, and increase quality and frequency of military exercises. I am sure that you will be at the vanguard of this complex and highly responsible work, and, as commanders at the different levels, you will make maximum effort to ensure effective training of service personnel. It is your direct duty to make military professionals out of your subordinates and teach them to become true patriots and competent, responsible specialists. Of course, you must also set an example in all areas, be a moral authority for the service personnel under your command, and preserve the honor of your uniform and the high status of Russian officer. 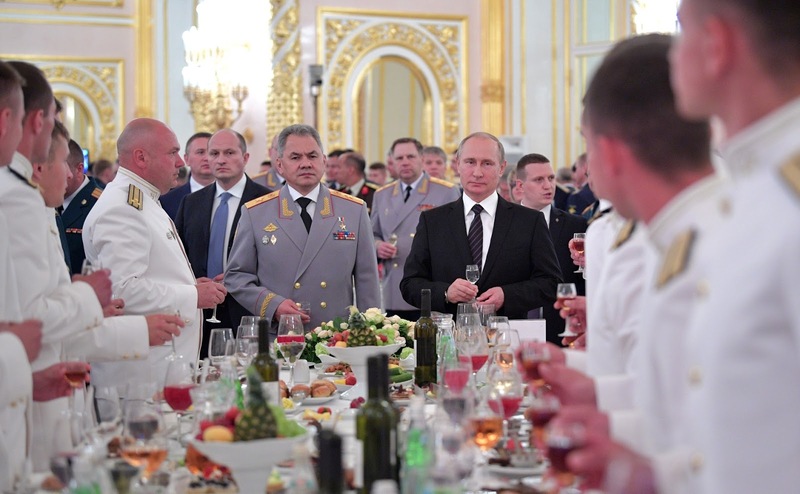 Russian President Vladimir Putin and Defense Minister Sergei Shoigu. The law enforcement agencies and security services have important tasks before them today, chief of which are countering terrorism and extremism and fighting crime and corruption. As before, these tasks require professionalism, operational skill, and competent use of the latest technology. You must work consistently to improve key performance indicators in your work. It is important to ensure that each crime is solved, that the guilty are brought to justice and receive lawful punishment. This is what the public wants to see from you and you must live up to their expectations. For our part, we will continue to pay attention to strengthening social guarantees for military service personnel and personnel at law enforcement agencies and security and intelligence services. We will continue to ensure decent wages, provide permanent and service housing, and raise the quality of medical care for service personnel and their family members. 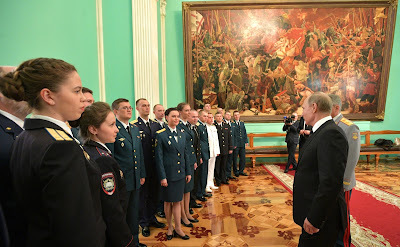 President Putin at a reception in honor of graduates of military academies. We still have much to do to strengthen all of our different security services and armed forces. I hope that you will execute these tasks flawlessly and service Russia with honesty and devotion. Once again, I congratulate you on your graduation. I wish you good health and success, and happiness for you and your families. I propose a toast to Russia’s officers, to the continuation of our Armed Forces’ victorious traditions, and to our great Motherland! At a reception in honor of graduates of military academies. Russian President at a reception in honor of graduates of military academies. 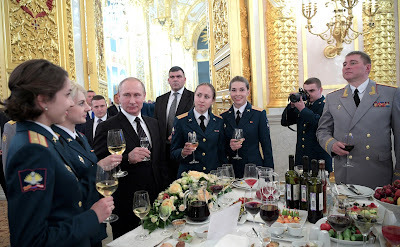 Vladimir Putin with military academy graduates at a reception in their honor. The President of the Russian Federation Vladimir Putin. 0 Comment to "Reception in honor of graduates from military academies."